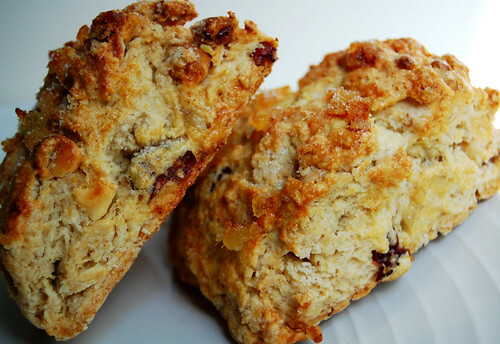 Buttery scones loaded with toasted chopped walnuts, cranberries and white chocolate chips. In a large mixing bowl, sift together flour, baking powder, salt and cinnamon; whisk in 6 tablespoons sugar until combined. Knead in butter, using fingertips, until well incorporated and mixture starts to clump together, forming pea-sized lumps. Gently stir in cranberries, walnuts and white chocolate chips until combined. Turn shaggy dough out onto a floured surface, and gently pat and knead until it comes together, handling as little as possible. Form two (6-inch) rounds. Insides of the rounds should be thicker. Slice each round into 6 equal triangles and place on cookie sheets. Whisk the additional egg in a small bowl and brush evenly on scones; pat crystallized ginger into the tops and sprinkle with additional sugar if desired. 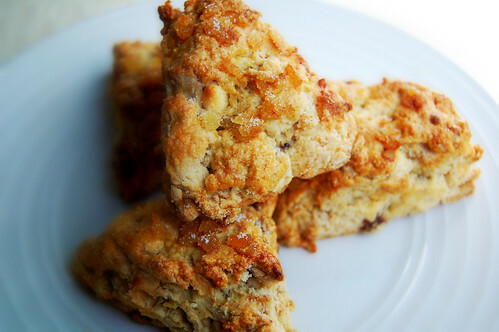 28 comments on "Cranberry, White Chocolate & Toasted Walnut Scones"
...and end up with scones. I'll cede the scone title to you. I'm sure you could beat me in a throwdown. You may be in a pancake mood, but you just put me in a scone mood. Haha. I agree. I just really want some pancakes right now. These scones...yuuuuummm. I've been too lazy to bake, wish you lived next door! I did watch that throwdown awhile back, also made pancakes last night as an after-dinner snack :). it's hard when you see goodies like this when you haven't eaten breakfast yet. I want to take a bite out of my screen..
Yummy, scones! You'd SO win if Bobby Flay challenged you to a "scone throwdown." :) I want a scone...but now I want pancakes too. Mm... I love cranberries and cinnamon in scones or muffins. They go perfectly with a bold cup of coffee or an Americano. Bring on the jam and cream, these scones want s to be eaten.....maybe a nice cup of java on the side!!! Scones are a good pancake substitite it they are studded with chocolate and cranberries. yummy, I need to try to make scones once in my life. Why not start with these? Hmm, I've always wondereed, does unbleached flour make a difference? I want to try this recipe, but all I have is bleached. oh yest!! please can I have six for breakfast? delicious! okay, this sounds really good. There was this little cafe in Cape Cod that I used to go to..Caffe E Dolci I think...that had the most amazing cranberry scones. MMM-I am sure this would be just as good..maybe better! Congrats on half a million views since you got sitemeter! Shalom! Anon, recently I switched over, but I don't think it makes that much of a difference. Bleached is fine. Do it! That picture makes me want one of those scones now! I have never made scones before and definitely want to give it a try. I will try your recipe first since they look so good and I've made some of your recipes before and they have always been good! Sigh. 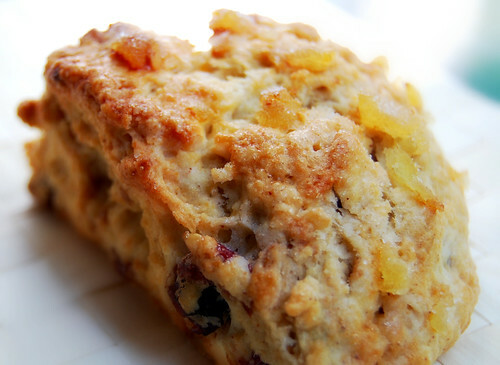 This post just had to be about scones. We're making pancakes here right now, but I'll take a scone>pancakes anytime. And those are perfect scones! How do you not weigh 600 pounds? I don't get it. And scones are my favorite, so keep 'em coming! With the link in the beginning, I really thought you were going to rickroll us with that link, haha... (I'm guilty of that. but at least I made it obvious). I am currently in a " scones " mood! Sorry I haven't checked your blog in so long. I've missed reading your posts and how talented and creative you are with your recipes! Blueberry pancakes make me think of No Reservations. Yum! These scones look incredible. I wanna eat them right off the screen. Yum. I'm a newer scone convert. These look de-lish!